Attractive foliage and flowers but can be scratchy to touch so useful for controlling foot traffic. 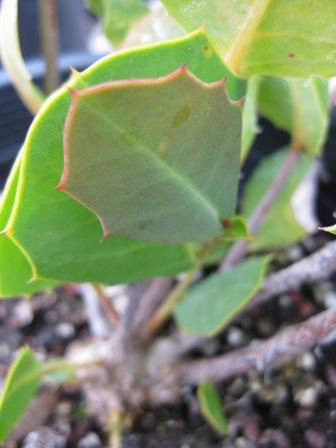 Leathery green-grey leaves with pointed tips. Flower buds are green, opening to white and red and are profuse and honey-scented. It has a lignotuber and so responds to hard pruning. Attractive screen or windbreak. Propagation Information: Seed germinates readily. Sow 3:1 Perlite:Peat. Lightly cover seed. Drench seed with a fungicide to prevent "damping off". Seed should germinate in 30-45 days.